Last weekend of november Gothenburg Roller Derby hosted the second game weekend of the premier league of Swedish roller derby. 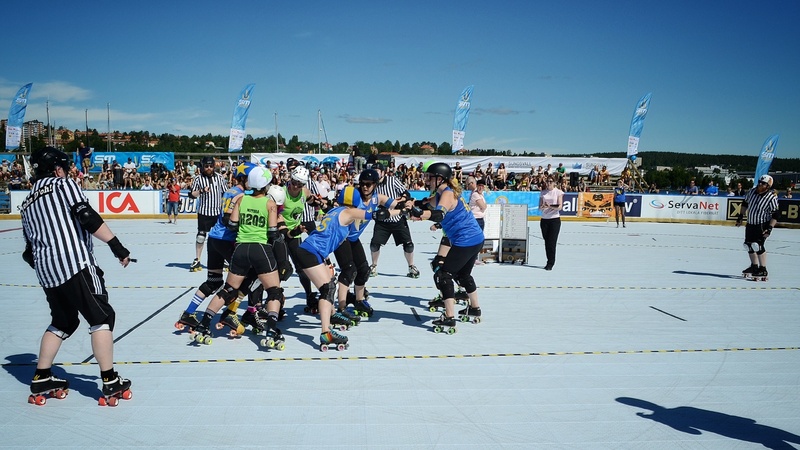 The A-Team took on both Luleå Roller Derby and The Royal Swedish Roller Derby and won both games, which meant a second place in the Swedish ranking and a 44th place in the European ranking. On Saturday The A-Team played Luleå Roller Derby’s Slaughter Daughthers. The teams played each other for the first time in Luleå in February of 2013, where Luleå won with a 27 point differential. Since then, the teams have played each other four times. The teams are very familiar with each other’s strengths and weaknesses, something that was shown on the track. This weekend, both teams showed that they were in control of their own game, with clean hits, good positional blocking and great walls. If you did not look at the score board, you would say the game was even. However, The A-Team kept and increased their lead throughout the game, that ended with a 201 point win for the home team. On the next day The A-team played Royal Swedish Roller Derby. If the opponents on the Saturday were familiar that was not the case on the Sunday. The teams had not played each other for over two years, and both played hard to come out victorious. The A-teams blockers had a hard time containing the Royals jammers, who were both agile and strong, working their toe stops on the edge of the line. But The A-Team managed to take the lead in the first half, due to good offense strategies. The A-team’s jammers faced hard walls and blockers heavy hitting blockers, but they managed to pull through and earn Gothenburg the second victory for the weekend. Final score ended at 255-83 in favor of The A-Team. We congratulate the team on reaching their goals for this first half of the season, winning six of seven games. With lots of dedication and hard work they have climbed the European ranking from 81st place in the beginning of the season to a 44th place. They now take a short break over Christmas, but will be back with full strength in January. Don’t miss The Badass Beaver’s last game of the season on the 19th of December, when they take on Dock City Rollers Plan B for the second time this year. In January Plan B came out victorious after a close game. Come cheer on the Beavers’ as they retaliate. Parts of our A- and B-team on the first practice for this season. Last week Gothenburg Roller Derby started training again after six weeks of well-deserved derby vacation. Our league continues to grow and this autumn we welcome 12 new rookies and one transfer from Visby Valkyries. The first practices, we have felt stronger and better than ever and we are now very excited to kick start this season. Both the A-Team and the Badass Beavers have new skaters and are thrilled to play games outside of Sweden, in Germany and Spain. But before anyone travels that far, the A-Team will travel to Malmö to play both Dock City Rollers and Stockholm Roller Derby BSTRD:s in the first Elitserie weekend for this season. Elitserien is played for the second year in a row and this years’ competing teams are: Stockholm Roller Derby, Crime City Rollers, Dock City Rollers, Gothenburg Roller Derby, Luleå Roller Derby and The Royal Swedish Roller Derby. On the 17th of October The A-Team will play their very first WFTDA game against Barcelona Roller Derby. This is a mile stone in the journey of Gothenburg Roller Derby and something we have been working towards for several years. 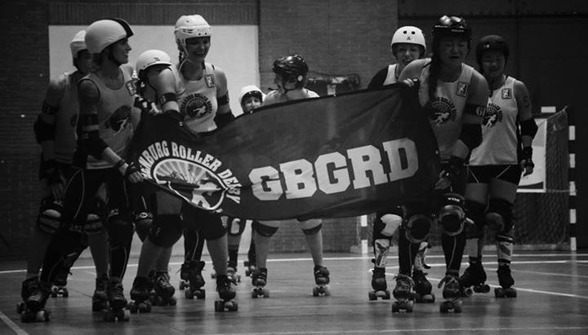 The weekend before that, Badass Beavers are travelling to Ludwigsburg in Germany to play Barock City Roller Derby. This will be our B-teams first ever away-game, another big mile stone for us. For more information about our teams’ games this season, please look at the tour dates section of our homepage. Gothenburg Roller Derby, The A-Team, traveled to Västerås for the last game of this years swedish roller derby league, going up against Västerås Rollerderby. The A-Team walked away with the win and are now ready to compete in the Swedish Championships this summer in Sundsvall. The A-Team also climbed one step on the European Flat Track Stats and are now ranked 85 in Europe. The A-Team took the lead in the first jam against Västerås Rollerderby and played a steady game. With a lead around 20-30 points The A-Team went into the second period with an upper hand. For the second period The A-Team kept up the score difference and Västerås Rollerderby was not able to catch up. The A-Team kept the lead through out the game ending with a score of 133-175. It was a very exciting game with lots of good offence play. We are very proud of our win and we thank Västerås Rollerderby for a great game. This win qualifies Gothenburg Roller Derby The A-Team for the Swedish Championships which takes place the on 4th and 5th of July in Sundsvall. We'll see you there! Get all the updates about the Swedish Championships here. 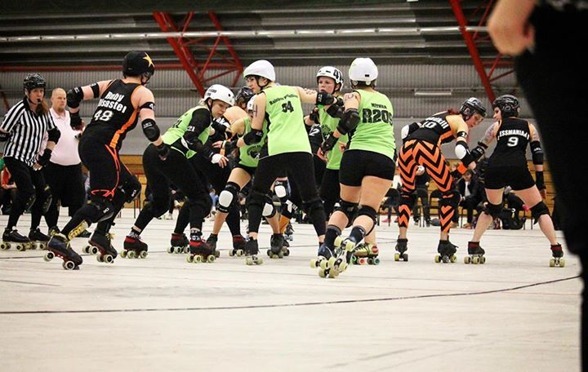 The A-Team travelled to the northern parts of Sweden to play Luleå Roller Derby's Slaughter Daughters for the second to last game in the Swedish roller derby league for both teams. The A-Team won over Slaughter Daughters and are now one step closer to competing in the Swedish championship in July. The A-Team also climbed on the European Flat Track Stats and are now ranked 86 in Europe. The A-Team took the lead first jam and started out with a steady growing score difference. Halfway through the first period the scoreboard read 2-49 in favour of The A-Team. Slaughter Daughters picked up the pace and started to catch up leaving the scores 49-74 at halftime. The A-Team kept the lead from start through out the second period as well ending the game with a final score of 98-187. It was a tough game with strong walls and hard hitting as well as strong and sneaky jamming. We thank Luleå Roller Derby for a great game and an amazing weekend up north. Read more about the game in a local newspapers sport section here. For their next game The A-Team travel to Västerås to play Västerås Roller Derby for their last game leading up to the Swedish championship. Join us in Västerås the 23rd May and cheer for The A-Team. 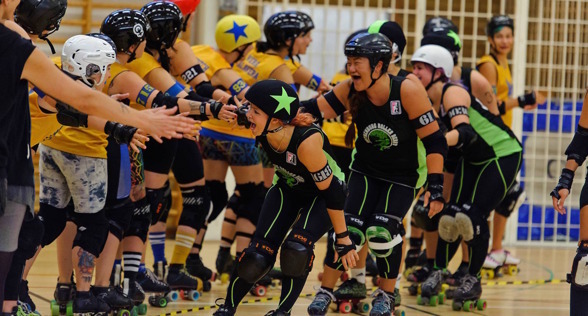 This March Gothenburg Roller Derby was accepted as a full member of WFTDA - Women’s Flat Track Derby Association, after approximately 1,5 years participation in their apprentice program. 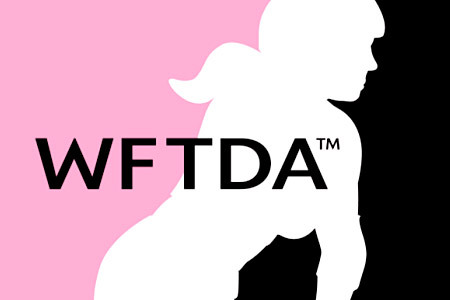 WFTDA is the international governing body of roller derby and a membership organization for leagues to collaborate and network. As new Class C members we can now enjoy the benefits of full WFTDA membership, including competing in sanctioned games, attending the WFTDA Annual Meeting and becoming eligible for rankings. We are very excited to be a part of such a strong international roller derby organization and community and we are looking forward to the educational opportunities as well as expanding as a league and joining in developing international roller derby. Two other Swedish are full WFTDA members: Stockholm roller derby and Crime city roller. Several other Swedish leagues have apprentice status. We are happy to take the third spot as full members in Sweden and have great hopes for the future! Last Saturday Gothenburg Roller Derby had two Danish teams over for a double header in Angereds arena. The first game, between GBGRD Badass Beavers and Aalborg Combat Bullies ended 99 – 276. The Danish team has only been bouting for about half a year, but has come a long way in those six months. Badass Beavers managed to keep up the spirit and scored 99 points, even though one of their main jammers got hurt and could not play the entire game. The game between GBGRD The A-Team and Aarhus Derby Danes was a closer one. This was the second time the teams played each other and last time Aarhus won by 82 points. The A-Team was eager to get their revenge and took the lead as soon as the first whistle went off. They managed to keep their advantage through the whole game, but the point difference got smaller and smaller in the last trembling minutes of the game, which ended 177-150 in Gothenburg’s advantage. 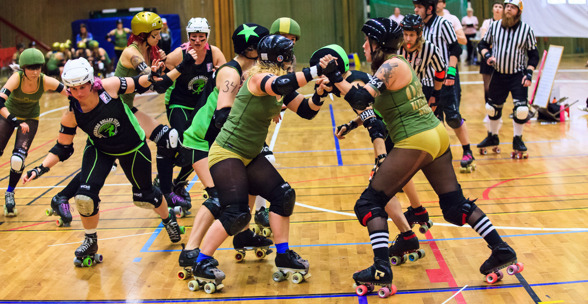 This past weekend Gothenburg Roller Derby The A-Team went to Zürich to play Zürich City RollerGirlz. When they left Switzerland on the Sunday they had not only won the game, but also climbed 13 steps on the European Flat Track Stats ranking, where they now are ranked 109 in Europe. The A-Team had a great start to the game. After the first jams the Swiss team was 40 points behind. Five minutes in to the game Zürich City RollerGirlz recovered and started scoring, but were not able to catch up with The A-team which consistently lead by 30-50 points. It was a tough game with lots of good and hard blocking, which you can see on the relatively low scores. 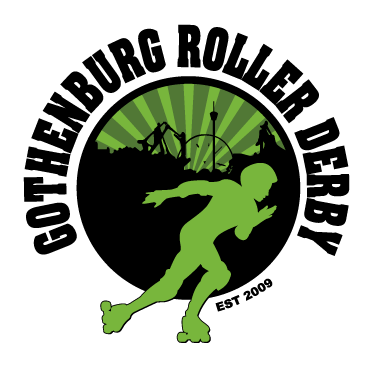 We thank Zürich City RollerGirlz for a great game, and are very proud of our win. On the 14th of March we play this season’s last home game in Angered Arena. The A-Team are eager to take revenge on Aarhus Derby Danes, who beat them by 73 points in June of 2013. Badass Beavers are playing Aalborg Combat Bullies for the first time. Both teams need your support! Don’t miss it for the world. It's been 370 years since Sweden and Denmark laid down arms and The Battle At Ranängen marked the end of the Hannibalfeud. The 14th March the Danes returns to Gothenburg, this time for a close encounter at Angered Arena. During two games Gothenburg will defend Hisingen from the Danes attempt of occupation. Children 7-18 years: 60:- door.